I have started to investigate courses about "Art of the MOOC", where MOOC is defined as "a course of study made available over the Internet without charge to a very large number of people." This woman is very inspirational. She is a mushroom growing expert from Zimbabwe. I have actually been in Zimbabwe. I have found the Neo-Dnyarri. I would love to have a propaganda video similar to this one, but with kids of multiple ethnicities. Not just white kids. Anyhow, showing kids doing various of physical activities in a gymnasium, is a great idea for political propaganda. This is because people associate kids with innocence, so they are much more likely to be open minded to a video with kids. Showing them doing various of sport activities, gives an association to strength and success. This will make people believe more in the cause. The Dnyarri were truly masters of psychic manipulation. The Taalo shield is a general awareness of our cognitive biases. 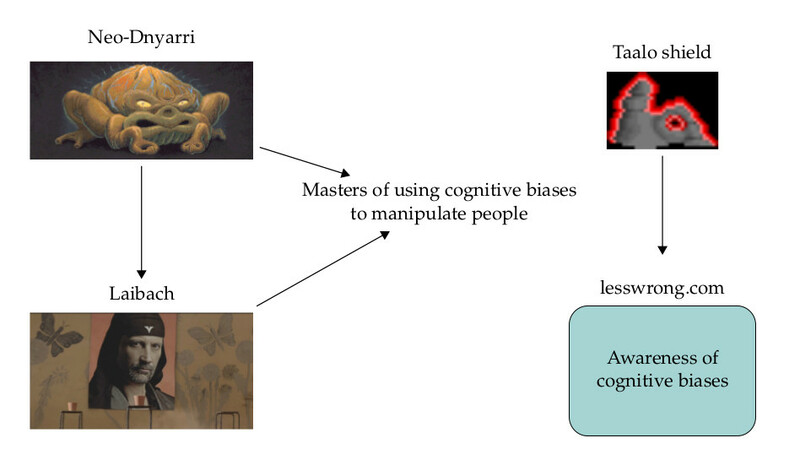 The Dnyarri use cognitive biases to manipulate people, while the Taalo have an awareness of their cognitive biases to protect themselves. It actually seems like Laibach are in the process of forming their own "virtual state". They have even started making their own passports. 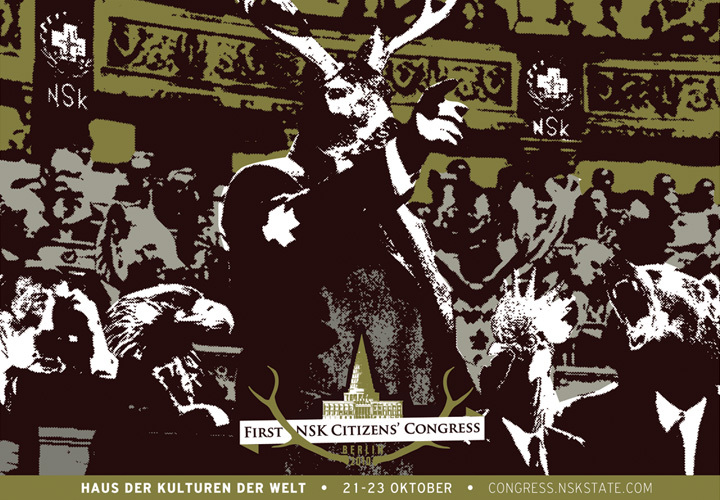 In the globalisation process that’s occurring right now, every person is a global citizen… We as global citizens can communicate and interact with each other and the [NSK] passport is a medium or tool for us to re-imagine what we can do. MC: Is it possible that someone has allowed, in Ljubljana, the first hero-city in Yugoslavia, a youth group to bear a name which aims to recall, by force, memories of the bitter LAIBACH!? LAIBACH: The very name and the sign are the visual materialization of the Idea at the level of an enigmatic cognitive symbol. The name LAIBACH first appeared in 1144 as the original name of Ljubljana, with the etymological meaning “town by the river”. It appeared again after the capitulation of Italy in WWII, when the Nazis and the Slovene White Guard imprisoned, tortured and murdered those citizens of Ljubljana who did not believe in the victory of the Third Reich. In 1980, with the emergence of a youth culture group, the name LAIBACH appears for the fourth time, though now it indicates the concretely given possibility of the formation of a politicized – systemic-ideological – art, as a consequence of the influence of politics and ideology. In this sense the name summarizes the horror of the conjunction between totalitarianism and the alienation of production, of industry in the form of slavery. LAIBACH: In its work, LAIBACH mainly uses the means of manipulative abilities of propagandistic nature and repressively exploits the power of information. First and foremost, these are the means suitable for collective consumption, with which the masses are first dissuaded from critical thinking, e.g. film (as the most powerful weapon of long-term and permanent influence on the spirit). We also include here the other instruments of propaganda strategy which primarily act on an emotional basis: open-air mass event (rock concert), speech (immediately working rhetoric in front of microphone and camera), uniform (taking over the military tradition), poster, and leaflet. Less, or only indirectly, we also use means which are not suitable for collective consumption and which address the critical intellect of the reader and demand a rational – discursive line of thought (newspapers, journals – journalism, literature…). Jure Pengov: I must say I can’t get rid of the impression that you recall the Hitlerjugend; is this only provocation, or do you carry within you more dangerous germs of nazi-ideology; could your Idea also be called nazi-punk? LAIBACH: Both the art of the third Reich and of socrealism have shaped and emphasised to perfection, within the framework of new state ideologies, the old classicist form of man, based on the principle of transhistoric humanistic ideals. LAIBACH analyzes the relationship between ideology and culture in a late era, shown through art. It discovers and expresses the conjunction of politics and ideology with industrial production and the unbridgeable divisions between this conjunction and the spirit. In designating this imbalance, LAIBACH uses all expressions of history. In its work, it practices provocation of the revolt of alienated consciousness and unifies warriors and opponents into an expression of the scream of static totalitarianism. Jure Pengov: All right, provocation; do you know how native Slovenes in Austria struggle for every Slovene word, for every Slovene signpost, how the fascists around Trieste challenge the native Slovenes, what do you say to that? LAIBACH: LAIBACH deals with the relationship between art and ideology, whose tensions and disharmonies it sublimates into expressive feeling. Thereby it eliminates any directly ideological and systematic discursiveness. Our activity reaches beyond concrete engagement and we are a perfectly non-political group. Concrete political problems in this sense are therefore of no interest for us. Jure Pengov: And why do you read the answers to all questions? LAIBACH: This form of interview (which is a message format) is actually a limit of comprehension, within which the subject is allowed to feign conceptual ignorance and communication. At the same time, the way of its formation is a process of permanent repression of linguistic models, and thereby also of the subjects which construct them. Such a form reduces the possibility of individual influences on the structure of the expression itself to a minimum; it is dictated through the totalitarian structure and understood as the right to incomprehensibility, non-communicativity. LAIBACH thus constantly degrades each communication at the level of the word to ideological phraseology. Jure Pengov: And what can you say about yourselves, eg. who are you, what do you do professionally, how old are you, are you all here or are there more of you? LAIBACH: We are the children of the spirit and the brothers of strength – whose promises are not fulfilled. We are the black ghosts of this world, we sing the mad image of woe. We are the first TV generation. Jure Pengov: Where is this from? Jure Pengov: You were formed three years ago in the mining districts of Trbovlje. You are extremely proud that you were founded in the Red Districts. Why? LAIBACH: The formation of the group is closely linked with the rise of modern consciousness and the new socio-economic relations, whose function and meaning were fully revealed precisely in Trbovlje, a town with a strong revolutionary and industrial tradition. The formation of the communist party, the “Trbovlje Commune”, the biggest miners’ strikes, the fascist action of Orjuna, tragic hunger strikes, unbearable working conditions, poverty, persecution of workers, high unemployment and the unbreakable revolutionary spirit constituted the pre-war Trbovlje. Today, the mining districts are changing their image; among the factories and the mines, a contemporary industrial worker has grown and matured, with a developed feeling of class affiliation. Few towns show in their exterior and their very life such great antagonisms between the old and the new as Trbovlje. This town has built us and we continue its revolutionary tradition. Jure Pengov: Are then the miners and workers there also proud of you? Did they support you when the police prohibited your activity? LAIBACH: The action in Trbovlje in 1980 was conceived as a test of the alertness and effectiveness of the authorities of state security, as a project which was to palpate the positive consciousness and defence mechanism of the Red Districts against incursions of subversive elements of another culture. As such, the action succeeded completely, since it had to be banned in its very conception. The workers acted in accordance with the policing-legal authorities and affirmed a high degree of positive consciousness. Jure Pengov: You present yourselves as provocateurs, you proffer yourselves as – one could say – public enemy no. 1. Do you have imitators? LAIBACH: Art is sublime mission which carries an obligation to fanaticism, but LAIBACH is an organism whose goals, life and means of activity are higher – in strength and duration – than the goals, lives and means of the individuals which comprise it. Jure Pengov: But aren’t you afraid that somebody might rough you up sometime because of all this? LAIBACH: Art is sublime mission and as such it carries an obligation to fanaticism. Jure Pengov: With all this adoration of totalitarianism, worship of the state, so to speak of Nazism, Stalinism, hierarchy, manipulation with people, what do you think then about the ingenious idea of Edvard Kardelj*, who said that happiness cannot be given to man either by the state, or by the system, or by the party, but that he can create it himself? LAIBACH: Neither the state, nor the party, neither God nor the Devil; happiness consists in the complete suspension of one’s own human identity, in consciously giving up one’s personal taste, conviction, judgement, in voluntary depersonalization and the ability for self-sacrifice, identification with a higher, superior system – with the multitude, collective, ideology. Jure Pengov: Was it perhaps this very depersonalization, alienation from people and everyday problems of people around us that led to the suicide of one of the members of your group? Jure Pengov: Who are your role-models, where do you draw your ideas from? You probably won’t claim that these ideas of yours are original? LAIBACH: Originality is an illusion of false revolutionaries, but our basic inspiration – role-models which are not models by their form but the very material of LAIBACH manipulation – are: industrial production, nazi-kunst, totalitarianism, Taylorism, bruitism, …and, of course, disco. Jure Pengov: So far, you have been spreading your ideology, your ideological provocation – to put it more precisely – by means of the written word. Was the decision to present yourselves to the audience of, say, half a million viewers of Slovene television, difficult for you? LAIBACH: Television – the medium of television – is, within the industry of consciousness (in addition to the school system) the leading moulder of uniform thought processes. The television program is fundamentally centralized, with one broadcaster and a mass of receivers, while communication between them is disabled. LAIBACH is aware of the manipulative abilities of modern media instruments (and the system which connects them), so it exploits fully the repressive power of media information in its propaganda actions. In this case, the instrument is the TV screen. Jure Pengov: So, if I understand correctly, you exploit television for your provocation; all right, so do WE! Maybe, maybe only now someone will get moving and prevent, repress these dangers, these horrible ideas and statements right here in the middle of Ljubljana. That guy reads like a crazy guy taking credit for things he never did. And we don't necessarily know everything about what is going on "behind the scenes", unless you are high up in the Central Intelligence Agency. Even though he seems to be evil, and not necessarily as smart as you, he seems to be much smarter than your president, and probably also smarter (and more dangerous) than most of the European right-wing populists. 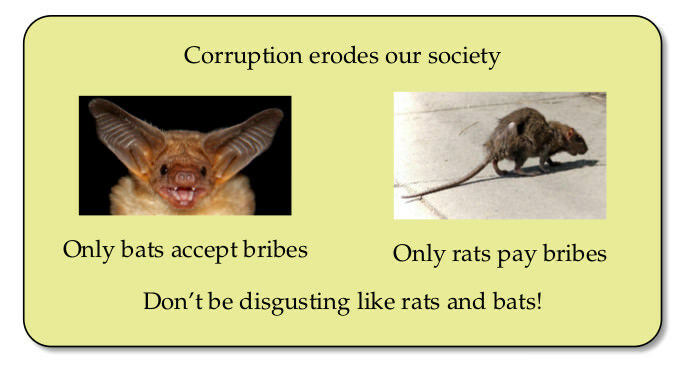 I am thinking that rats and bats would be well suited to create disgust for corruption. While babies and heroes would be well suited to create sympathy for discriminated people. In the game called "Dreamfall Chapters" one of the main characters is actually a homosexual hero. In the movie called "The Imitation Game", the main character is also a homosexual hero, based upon the real war hero called Alan Turing (https://en.wikipedia.org/wiki/Alan_Turing). 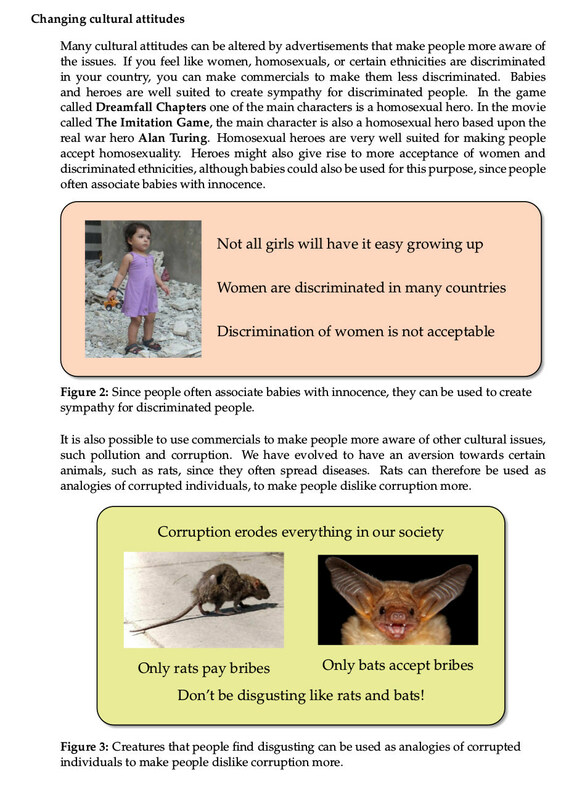 Homosexual heroes are great to make people accept homosexuality. The same might be true for discriminated women and discriminated minorities, although there you could also use babies to create more sympathy for them. Since people tend to identify with their countries, maybe I should make a script which puts the flag related to the IP-address belonging to the visitor in the mouth of the shark. Also, these are just ideas for what kind of art we should make. I know most of you are much better artists than me. 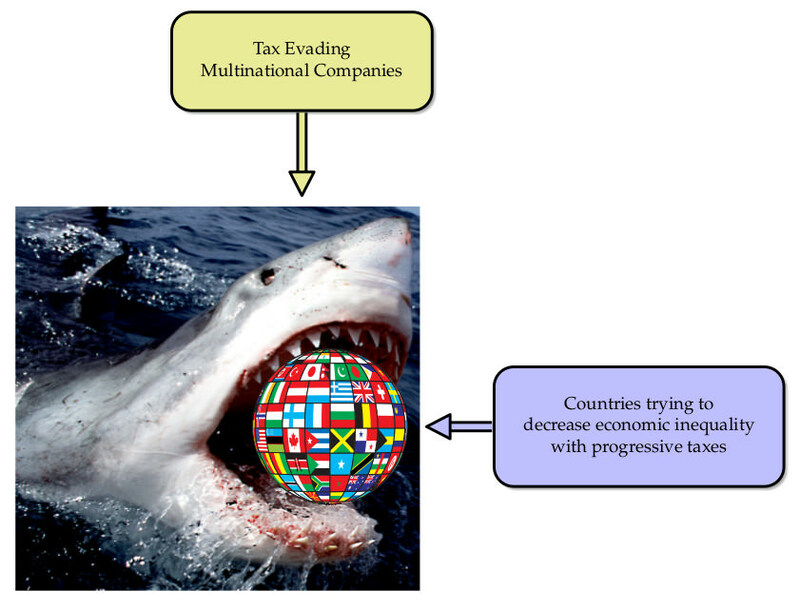 If your goal is to make people care about tax evasion you might also want to make a more 'data driven' decision about whether a shark is a good metaphor for tax evasion. For me, 2 images come to mind when talking about tax evasion. Fat bankers and empty offices with plants in them. This second one is due to the fact that I saw some media coverage about the way foreign companies evade taxes and try to evade the tax inspectors by placing a plant in the office. Because the tax inspectors use that as a check to see if an office is really being used or just for tax evasion. I agree with you that fat bankers probably is a better analogy for tax evasion than a shark, but is it equally repulsive? Since women tend to care a lot about status, It is actually not so uncommon for women to be attracted to fat, old, rich guys. One such example is Melania Trump. Rather than just finding the best analogy for tax evasion, we must also think about finding an analogy that people find sufficiently repulsive. I actually think that most people will feel more aversion towards a shark than towards a fat banker. Did Christmas before that have anything to do with Coca Cola? Nope, but over the years, Coca Cola managed to make people associate their product with Christmas. They weren't just thinking about the sales of Coca Cola that Christmas. They were thinking about the next one, the one after that, and so on. Advertising isn't just about finding the best analogy. It is also about making new associations. Do you all see your own flag in the mouth of the shark? Nope. It shows me the Union Jack, whereas my IP should show Dutch adresses, and my language settings/nationality is German. It correctly places me in the USA.